Asking a filmmaker to rank his or her favorite characters is a bit like asking parents to rank their kids (I was my parent’s favorite, I’m sure of it). And while we don’t know enough about the upcoming Star Wars: The Force Awakens to judge for ourselves yet, director J.J. Abrams has certainly spent a lot of time with these folks, and he just revealed his favorite. I can only say that Gwendoline Christie is my favorite. She just killed it. You think, "Well, what? It’s wearing a costume." But it’s a lot to wear and to have a performance when you’re wearing that requires a different kind of skill set and an additional talent, and she’s got it. It’s an incredible thing to work with her. I am glad that a character has been designed that is visually as stunning as that is, because she deserves it and the fans do to. When I first saw that design my mind was blown because it looked so undeniable. Admittedly, this doesn’t reveal much, or anything, in the way of new information about the film, but to hear Abrams talk so glowingly about the performance and the character is promising indeed. We’re already pretty damn pumped to see what the Game of Thrones star brings to the Star Wars universe. 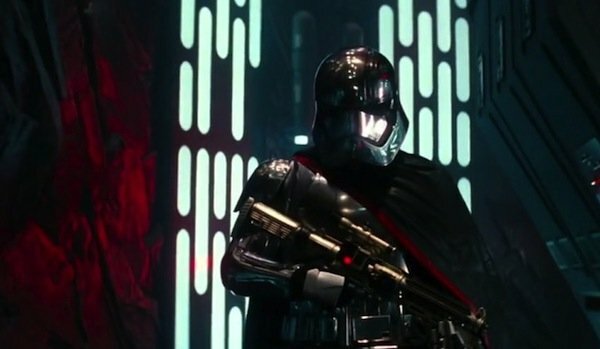 Since we caught our first glimpse of Captain Phasma, Gwendoline Christie’s character, which many dubbed the Chrome Trooper before we knew the deal, we’ve been stoked to find out what she was all about. We’re also curious to see if she’s the only one decked out in this armor, but whether she is or not, she looks totally badass. We caught glimpses in concept art, but it wasn’t until the second The Force Awakens trailer came out that we caught a good, if brief, look at her in action, and her identity was revealed in that big Vanity Fair spread. We don’t know a ton about the character, though she is an officer in the First Order, the new version of the Empire that has taken hold in the 30 years since the Battle of Endor. She apparently lives, or is at least based out of the Starkiller Base where General Hux (Domhnall Gleeson) and Kylo Ren (Adam Driver) also operate. The character was reportedly gender swapped, originally written for a man. Whether or not this is true or not, or a response to criticisms of a lack of a female presence in the cast, perhaps we’ll never know, but it’s hard to argue with casting Christie. For all we don’t know, we’re well aware that she’s a total badass, and we look forward to her wreaking havoc in that far, far away galaxy. There are also reports that the Captain Phasma was named for the murderous silver ball in Don Coscarelli’s classic Phantasm, because the armor brought that bit of horror ephemera to J.J. Abram’s mind. That’s pretty damn awesome in our book. There have also been rumors, unconfirmed of course, that suggest Captain Phasma could play a substantial role moving forward in the new Episode movies, that she won’t just be a one-off. Perhaps she will serve as a continuing antagonist, someone who doggedly pursues the heroes. But there’s also a chance she could become good, or at least find redemption eventually. Hell, if a guy like Han Solo can bag a princess, or a cause as lost as Darth Vader can be redeemed, nothing is outside the realm of possibility. We’ll find out why J.J. Abrams thinks so highly of Gwendoline Christie’s performance when Star Wars: The Force Awakens hits theaters December 18.